After a big hit of schadenfreude for some on June 8, and a large slice of humble pie for others, the task remains to seriously consider what went so right for Labour in the general election and what must be done now to win a majority. 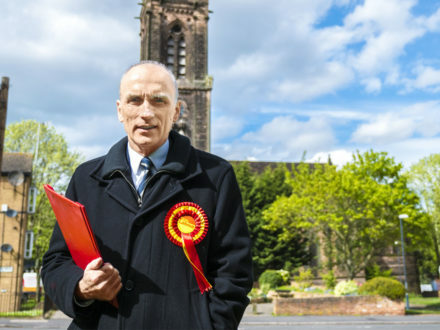 This account comes from my first hand experience of helping to manage Chris Williamson’s successful bid to win back Derby North, a seat we lost to the Tories in 2015 by a mere 41 votes. This time around Labour won with a swing that was slightly higher than the national average (2.1 per cent compared to 1.8 per cent) – but the real significance of this particular gain is two-fold. First, all of Labour’s losses were in Brexit-backing constituencies in the Midlands: Mansfield (newly Tory territory), Stoke-on-Trent South (likewise), Walsall North and North East Derbyshire. Surprisingly Lincoln and Derby North bucked this trend. Second, Chris Williamson ran on an explicitly pro-Corbyn message. As early as 2015 Chris claimed that an anti-austerity platform was needed to win back Derby North, a position that bolstered his unwavering support for Labour’s current leadership. Days after receiving nomination – and when the polls were giving Labour very little to go on – Chris was happy to be labelled as a “test case” for Corbyn’s new kind of politics. So what was the Corbyn factor in this campaign? From my experience, Labour’s anti-establishment politics won on paper, it won on the ground and it won on the airwaves. The release of Labour’s manifesto was a turning point of the campaign; it was also a turning point in Corbyn and McDonnell’s messaging. During the leadership election in 2016, Corbyn’s “ten pledges to transform Britain” were heavy on state-led investment but light on tax and spend. The plan for a national investment bank wasn’t dropped from the manifesto; indeed the bank represents the basis of a new deal for Britain. However, the shift in emphasis cut through to ordinary voters. Labour proposes to re-balance the tax system away from the nation’s elites, bringing it more in line with other developed nations and making it ultimately fairer. These are common sense proposals. Corbyn’s new kind of politics also provided Labour with a mass base of mobilised activists. Critics of Corbyn’s energetic core constituency had uprooted frames of understanding from a by-gone era, failing to notice the fundamental shift that has occurred in the left’s appeal. In the pre-Kinnock era, Labour’s left wing could be accused of a relatively exclusive appeal to sections of the working class in an economic period in which the post war model was on the brink of collapse. The Corbyn factor, however, captures the trajectory of post-‘68 social movements making its appeal in the language of “the people” and not only trade unions. That cultural shift bore fruit on the ground in this election, as well as in the polls. The increase in youth turn out was fundamental to Labour’s advances, yet that outcome owes a huge debt to the wave of campaigning by Corbyn’s army both online and at the door step. Momentum was fundamental to organising this crowd of support for Corbyn, something the party itself has shown little interest in. A training event for canvassers held by Momentum in Derby North attracted more than 80 supporters, many of them having never knocked on a single door before. The workshop represented a break with typical party approaches to canvassing as representing something of a data gathering exercise. Instead, Momentum promoted a technique based upon listening to the problems of undecided voters, isolating the issue and offering the solution – and it worked. At the peak of the campaign we had almost 150 people canvassing for Chris and twice that amount on polling day. Momentum and the crowd of support for Corbyn also picked up the slack in the party’s social media campaign. In one instance, a single video produced by Momentum reached 17 million Facebook users. Having been part of Corbyn’s second leadership challenge I helped to transfer some of that energy and experience onto Chris’ campaign, lending it, in my view, the most dynamic social media presence out of any PPC. Labour remains behind the curve on online advertising, despite launching Promote, an online tool for PPCs to augment their social media presence. This initiative’s major flaw, however, is that it relies on candidates and their agents being fluent in everything from graphic design to the back end of social media platforms – and most aren’t. In future elections every candidate should employ someone who is. So how can these brief insights be transferred? Work should start right away in nourishing Labour’s lively activist base, especially in areas that are typically less cosmopolitan than, say, Croydon. Local organisers and members should consider community organising a fundamental part of their work and seek to move with the flow of Corbynism, not against it. Likewise, cultural interventions such as those pioneered by the GLC should perhaps be revisited. These efforts were labelled by some at the time as “loony”, yet today LGBT+ rights and respect for diverse cultural backgrounds doesn’t seem so strange. Theresa May is a sitting duck. Her feeble efforts to form a coalition with the socially regressive DUP, and her commitment to the free market at the cost of human dignity, represent a step backwards for this country and cast a vision for Britain in the grim light of the 1930s. Labour today is alive with the youthful spirit of hope in our future. We must all do our bit to swell that tide. Lewis Basset was mobilisation coordinator for Chris Williamson’s campaign in Derby North.